just back from bahia rock hotel. booked last minute deal with qwerty travel. we wanted a week in the sun to relax and thats what we had. staff at hotel were lovely and friendly, apartment was spacious and clean, well equipped kitchen area, comfy beds, towels changed every two days, with lovely balcony overlooking mountains, pool area was spotless and the grounds and gardens beautifully kept. hotel 2 mins from lovely beach and prom, which you can walk along either to new marina or playa blanca. we atayed half board and the food was brilliant for a 3 star hotel. plenty of variety and choice each day. hot food, salads, local cheeses and hams, fresh bread and rolls and a selection of meats and delicious fish cooked to order. the chefs were happy and smiling and always making jokes and happy to help. the staff were all lovely, pool attendants, grounds men, maids, all spoke and smiled whenever you saw them. we met some lovely people who were staying for several months and i can understand why. 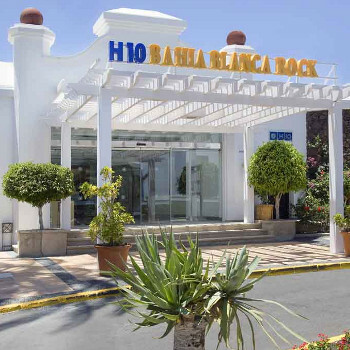 the bahia rock has a friendly relaxed atmosphere and a great location. childrens entertainments was great for kids and the team had real laugh with everyone without being annoying. we filled in survey one evening and we could only mark down the evening entertainment which was pretty poor, the following day the team phoned me in apartment to ask how they could improve the score!! i work in customer relations so was very impressed by this response and sure enough following our chat they made effort to gear the evenings to more adult entertainment - singers, more dancing music etc and low and behold the bar area began to fill up and the guests stayed in the bar and our last night was great fun with everyone getting slightly drunk and dancing till late. we had a lovely week in the sun, i would recommend this apart hotel to anyone. I have stayed in the Bahia about 8 times and will hopefully keep coming back have booked for May next year. If you are looking for luxury forget this place if however you want to stay in a place that retains that magic that we as children experienced on family holidays the Bahias for you. Its the feeling you get here that matters having stayed in the Lanzarote Princess and other 5* hotels I would much rather stay here. The rooms are spacious and so much better than a well furnished hotel room as you have the option of a microwave and fridge a must with a baby in tow. The staff have been ther since I first visited and remember you you don't get that formality which I find uncomfortable. The entertainment is really bad which is the joy of the place the children don't mind and are always included and you will always find other couples and people only to ready to talk to you.The animation team is enthusiastic and genuinely interested in the children. I have booked for tenerife in August and am already regretting it will take a lot for it to live up to this place. We arrived after booking directly on H10 web site as a special offer of approx 28euros pppn. The reception staff took my email confirmation details and proceeded to book us in. Please beware they asked for more than 120 euros over what special offer we booked but I politely pointed out the confirmed price as per email was much lower! So please check your email comfirmation from H10 that the price you booked is noted on your confirmation! Also you will have to pay up front for reservation rather than at check out, not sure why! Anyway we had room 229 which overlooked pool and was on upper level, but were greeted by dead cochroaches at door (lovely surprise!) overall this room was ideal for us & tot. No more nasty surprises! A bit of advice also - we had a bad sewage smell from our bathroom and I remedied the problem by making sure that all bath plugs were in and this stopped the smell coming up from the pipes and toilet. The hotel ran a kids club but since my son is 3 most children there were foreign and much older so we didn't put him in club - maybe we went quite early in the season, but the kids had a great time with the anamacion team! Hotel was clean throughout and very friendly staff also. The food in the evening was disappointing we ended up eating out even though we paid for h/b. It was buffett style but geared more for the Europeans?! We didn't watch any of the entertainment as the bar area was smokey (I was 6 months pregnant) and the seats were set up like you were sitting in a theatre. Also it was a very small room! I wouldn't go back to hotel unless I had kids between 5-10 and you don't mind mingling with the Europeans who just don't make an effort anyway. The hotel is located just 5 min walk from beach, next to Princess Yaiza and Playa Dorada hotel. The pools were lovely and overall I would give it 3 or 4 out of 5. We decided going here after a friend of the family said it looked a very nice place whilst they visited staying in Lanzarote. As we arrived we booked in and were given our apartment. The apartment was of an excellent condition and was cleaned by maids very nicely. Since we arrived early in the morning, we decided to go straight to the pool, which also was in an excellent condition. The pool bar did a lovely variety of food and definitely would say the waiter serving at the bar could understand English very well, which is handy!! The animacion team was great for our two teenagers and the children also staying in Bahia Blanca Rock. Even adults got involved in the activities throughout the days. (If the children allowed the team to, they would be chucked into the cold pool if they lost a game) Which i remember was hilarious to the kids! The location of this hotel was amazing, only a couple of minutes walk to an amazing lovely beach, with good water sports. Including, paragliding, banana boat and the relaxing pedellos. Also the hotel was about ten minute walk to the town centre. I would definitely recommend this hotel to family's, as you would enjoy it a lot!! The best place for getting a luscious tan would have to be the sunbeds on top of the cave that hangs over the warm pool! Happy Holidays!! The accommodation forms several terraced blocks of 2 storey apartments set in very pleasant landscaped surroundings. Our apartment consisted of kitchen dining/living area and separate bedroom with twin beds pushed together to form a double. Our kids (10 & 11 yrs) slept on a settee and fold down bed (stored under the settee) respectively, which they found comfortable enough. We stayed in a ground floor apartment and were visited by 4 or 5 cockroaches in total during our 14 night stay. I don't put this down to uncleanlines because the rooms, common areas and grounds were kept very clean. It was more likely on account of the unavoidable factor that we had the patio door and bedroom windows open for long periods as the apartments aren't air conditioned; apparently roaches are a rare occurrence in the upper storey apartments. Only one portable electric fan, which is pretty ineffective, is provided, therefore the rooms are warm and humid overnight - which was bearable, given the fact it was October, however, the thought of sleeping there in height of summer wouldn't appeal to me. There were an abundance of sun beds available at all times of day due to the fact most guests were considerate enough to remove their towels when not utilizing them for long periods in the knowledge that they were always able to return and obtain some again later. The beach & prom is a 2 min walk from the hotel; Burger King, and Mollies Irish bar is a 5 min walk along the prom and the largest and best value supermarket is "Netto" located in the pedestrian precinct shopping area which is a 20 min walk. The hotel food was ok - the choice was limited and it was often luke warm depending on how often the chefs refilled the hotplates, however there was always something that appealed for us adults to eat, although there was little that appealed to kids. The restaurant & bar staff were the very friendly. We checked-in at the hotel at 2130 hrs just as the restaurant was closing, however, the receptionist arranged entry for us and we weren't pressured by the staff to hurry our meal which we appreciated. The night-time entertainment alternated nightly between the animation reps miming to the usual soundtracks (Cabaret, Moulin Rouge, etc - which doesn't appeal to us) and professional acts (magician, soul singing trio, etc which were of good. The majority of guests were German, Dutch and Spanish with kids under 7 yrs. Overall I would say that the hotel is a value for money three star with friendly staff, but I wouldn't return unless the minor negative points I mentioned were improved. I have visited this hotel twice now and would definatley go again. The location is great about 5 mins walk to the beach and 10 mins walk to centre of the resort which is good for people who have walking difficulties. The hotel reps are great and really persuade you to take part in day activities such as warterpolo which is a faveourite of mine as I won twice. The food was acceptable but could have been better for the children and certain people like my sister who are picky in certain fancy foods! The hotel staff are extremely friendly and after emailing them for an upstairs room overlookng the pool they were great and gave us what we wanted. The resort is close by with a burger king and smallish shopping centre over the road. The resort includes many restaurants and bars to chose from and also has a ferry ride to take you to near by island fuertaventura that has many departures fromt he nearby marina. Overall I think that both holidays were absolutley brilliant and have planned to go agian at the end of the year. After reading various reports on this hotel, I was slightly apprehensive about this accommodation. However it was not so as bad after all but personally I would recommend you stick to the self catering option rather than half board. The apartments were rather basic and needed some updating however they were clean. Also they are rather cramped for 4 persons. The hotel staff were always very helpful and always prepared to assist if requested. Stayed for seven nights and overall we had very nice holiday. The apartments could really do with an update but other areas of the hotel are in good condition. The food at the pool bar is ok but the breakfast and evening meal priced at 6 and 12 euros are a little poor. On arrival we were very disappointed with the apartment. The room was on the small side for 2 adults and 2 children. I am not sure when this room was cleaned for our arrival as the cupboards in the kitchen area were crawling with ants, which we dealt with quickly using a spray. We also had quite a few cockroaches in the apartment during our 14 night stay. Self catering facilities were extremely limited, no kettle, microwave or toaster, however we did not wish to cook in the apartment because of ants and cockroaches. There is no air con in the apartment and although we kept the curtains closed during the daytime it was extremely hot at night even with windows open. The pool area was very nice. We had no problems finding sunbeds at any time of the day. During the day the staff at the apartments were always organising activities and there was always something going on for the children if they wished to take part. The apartments are in a good location for beach, town and marina. We wouldn't go back to these apartments mainly because of lack of space and no air con.